Vienna is known as the city of music, and the city of dreams, and now, due to last year’s winner Conchita Wurst, also the city of Eurovision. We take a look at the history of this year’s host city. The city we know as Vienna was founded by Roman soldiers in the Year 15 BC, They named it Vindobona and it was meant as an army outpost in the ongoing struggle against the German tribes. But the earliest traces of human settlement in the area, dates back to approx. 500 BC..
Not much happened in the little town in the centuries to follow, it expanded slowly, now under the name Vienna, but when Leopold the First became count of the eastern Marsh in 976, things started to happen. The eastern Marsh is largely the areas known today as Bavaria, Switzerland and Austria. When Duke Henry in the year 1145 moved his court to Vienna, it became the centre of political power in the region, but it was far more important, when the Habsburgs established their dynasty in Vienna in 1440, making it the capital of the Holy Roman Empire. A political and military construction that lasted from 962 until 1804, and included most of central Europe from the Danish border in the north to northern Italy, today’s Netherlands, Belgium, Luxemburg, Germany, Czech Republic, Switzerland and Austria. Twice Vienna came under attack from the Ottoman Empire, today’s Turkey, first in the year 1529 when Suleiman the Magnificent made an attempt to overrun it in order to expand his empire into central Europe, and in 1683 when a full scale war, between the Holy Roman Empire and the Ottomans led by Mustafa Pasha, broke out. After fierce fighting the Ottomans once again suffered defeat. Due to the Napoleonic wars, the Holy Roman Empire collapsed in 1804, making way for the Austrians to become an independent state, and it was in Vienna that the new map over Europe, following Napoleon’s defeat at Waterloo, was drawn in 1814/15, perhaps its high water mark. One of the darkest chapters in Vienna’s history came with the workers and students uprising in the late summer of 1848, when they tried to prevent Austria from interfering in the Hungarian political crisis. The revolt lasted for 3 bloody weeks before put down by loyal troops under general Windich-Gratz. In the second part of the 19th century Vienna was the centre of European music with persons like the Strauss family, the kings of the waltz, Mahler and many more, but it was also the home of thinkers like Freud, the father of psychoanalysis. Two dictators to be Hitler and Stalin also lived in Vienna, but that was close to the outbreak of the First World War; Hitler a native Austrian trying to become a painter, Stalin on the run from the Russian secret police. Both men walked each day in the park next to the Schönbrunn Palace. It is almost certain that they passed each other, bowing their heads in hello, the two big rivals of World War II. Many years before that a far nicer person lived in Vienna, from 1781 until his death, only 35 years old, in 1791. Wolfgang Amadeus Mozart was his name, his music still lives on. You can’t visit his grave, because when he died he was poor and was buried in an unmarked mass grave outside the city. Losing, being a German allied, World War I, known as The Great War, the Royal family was forced out and Austria became a republic in 1919. A republic that only lasted some 19 years before the country became a part of Adolf Hitler’s Third Reich in 1938. What should have been 1000 years only lasted for 12, and in May 1945 Austria was forced to surrender to the Allies and Vienna was divided into four zones, just like Berlin belonging to the Soviet Union, USA, France and Great Britain. They stayed there for ten years before Austria was given back its freedom after signing a treaty of neutrality. Watch the movie “The Third Man” and you will get the picture. For many years Austria and Vienna lived in the memory of glory days past, but all of that was to change in 1970 when newly elected Bruno Kreisky took office and slowly started to alter his country’s politics, placing it and its capital, Vienna, as an important player in European affairs. 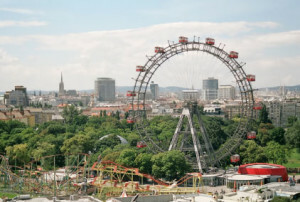 And today Vienna is a modern capital, ready for the future, but not forgetting its past.